In spring and summer, Tinocallis nevskyi alates are pale yellow, with pale or dusky antennae and legs (see first picture below). In autumn Tinocallis nevskyi have pigmentation on the head, thorax and siphunculi and frequently also on the tips of their marginal tubercles (see second picture below). Their antennae are 0.76-0.96 times the body length. The wings are hyaline and the veins of the forewings are not bordered with fuscous, nor is there a patch of fuscous on the hind margin at the end of vein Cu1b (cf. Tinocallis takachihoensis which has the distal branches of the media bordered with fuscous and fuscous patches at the distal ends of Cu1a and Cu1b). The pronotum has two pairs of pale finger-like spinal processes, and the mesonotum has one pair of large conical processes (see first micrograph below). The abdomen has spinal processes on tergites I and II, and lower wart-like tubercles on the other tergites and marginal tubercles. Tinocallis nevskyi siphunculi are short. The body length is 1.4 - 2.1 mm. Immature alatae (see second picture below) are pale greenish yellow. 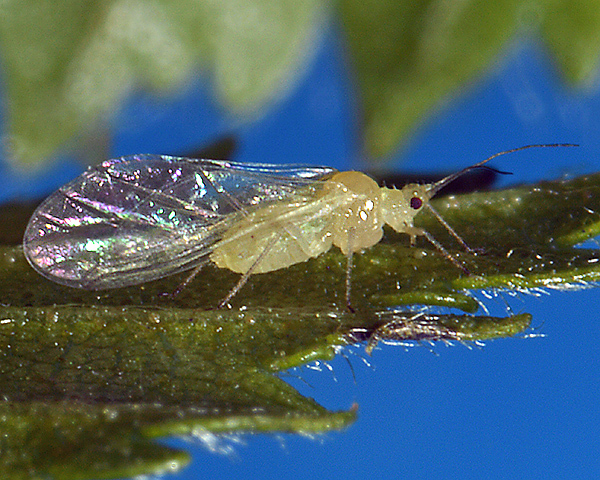 The pale Japanese elm aphid feeds on elm (Ulmus). This species originated in central and south-west Asia, but has spread over much of Europe. 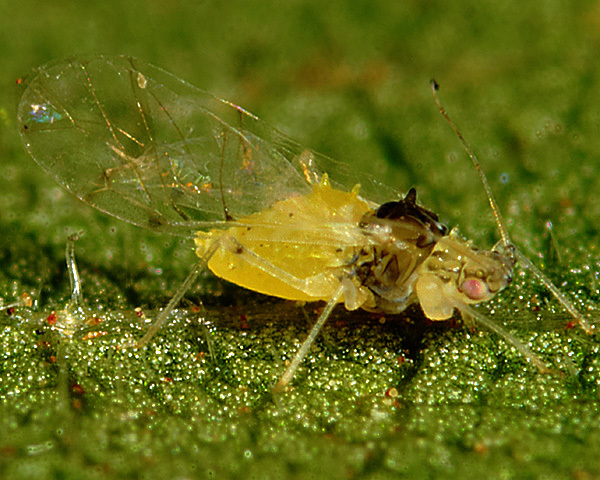 In some European countries Tinocallis nevskyi is now among the most common aphid species. Tinocallis nevskyi was first described by Remaudière et al. (1988) who separated it from Tinocallis saltans with which it had previously been confused. It was first recorded in Britain by Hopkins (1997) in Great Yarmouth, Norfolk, in August 1995 on Ulmus glabra and in Norwich on mixed elm (Ulmus sp.) hedgerow. Heie (2009) highlighted some of the distributional oddities of the aphid, noting that Tinocallis nevskyi is very common on Ulmus in southern Denmark in most years, but rare north of the middle of Jutland. Nevertheless it occurs far to the north in Sweden, where he found it in Dalsland in Middle Sweden. It arrived in Denmark from Central Asia as late as in the end of the 1970's or the beginning of the 1980's. It may still be extending its range in Jutland, but it still had not reached the northern Jutland, when he looked for aphids there the last time. Nafiseh et al. (2014) studied the biological characteristics and seasonal fluctuations of the aphid in two sites in Iran by weekly sampling from infested trees during 2002-2003. The aphid overwintered as eggs on the branches of trees. 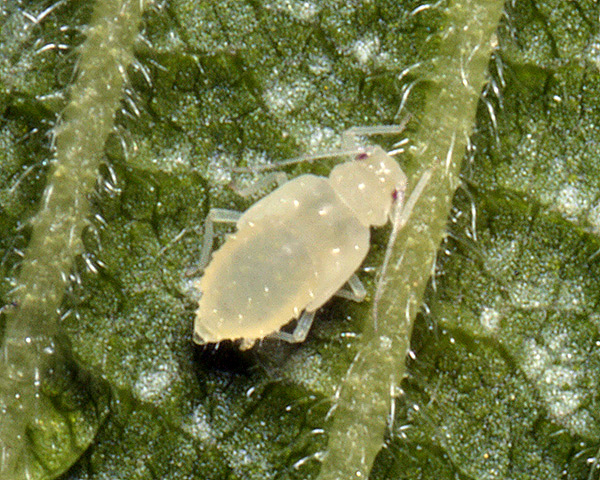 First nymphs were observed in early April. The first adult alatae were observed in late April, and the population of adult viviparae increased rapidly in May and June. Numbers declined in summer, but increased again in autumn. Alatae in the autumn (see picture below) have pigmented patterning on the head, thorax and siphunculi as shown below. 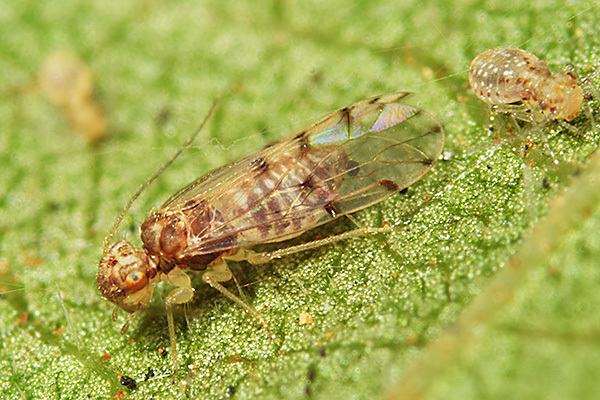 Wingless oviparae and alate males appeared in October. Oviposition occurred in early November to early December. Leaf cages were used to determine the important life table parameters of the aphid in natural conditions. 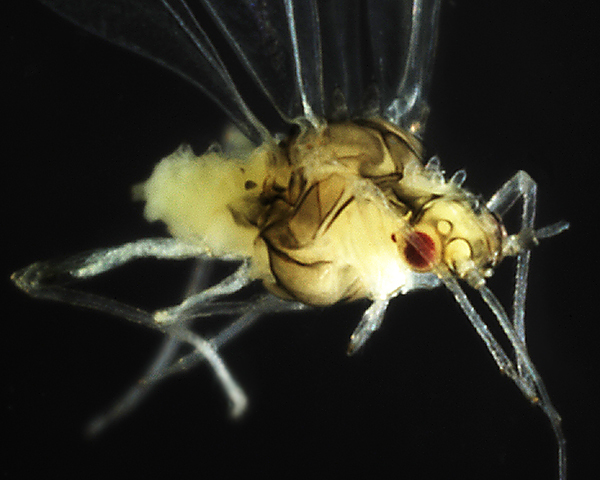 The intrinsic rate of increase (rm), finite capacity for increase, net reproductive rate and mean generation time of the aphid were estimated at 0.15 day-1, 1.17 -1, 14.89 nymphs and 17.54 days, respectively. There have been few observations on natural enemies of Tinocallis nevskyi. Barahoei et al. 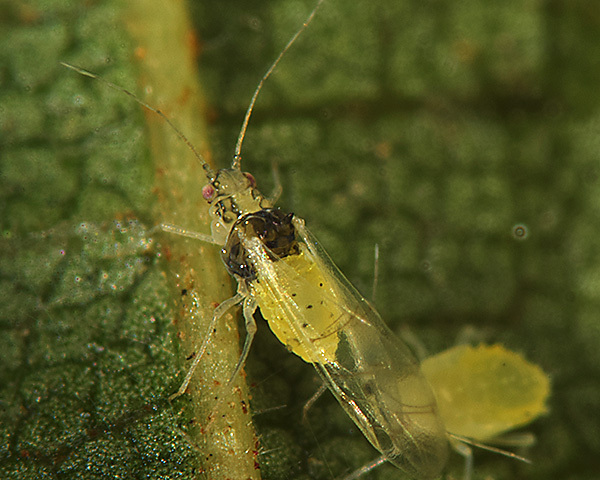 (2012) recorded the braconid Praon flavinode parasitizing Tinocallis nevskyi on Ulmus campestris. 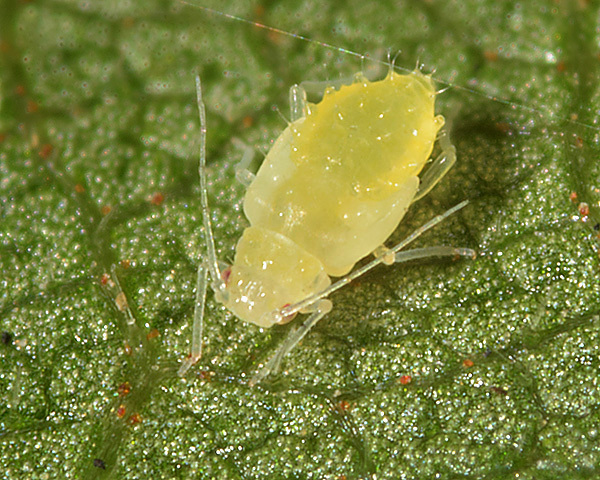 We have noted that Tinocallis aphids compete for space on leaves with psyllids such as Ectopsocus petersi (see picture below). Psyllids are sometimes very common, especially in autumn, and often cover the leaves with silk and detritus, which elm aphids avoid. Tinocallis nevskyi has been recorded from 4 Ulmus species (Ulmus glabra, Ulmus laevis, Ulmus minor, Ulmus procera). Of the 22 species that feed on wych elm (Ulmus glabra) worldwide, Baker (2015) lists 14 as occurring in Britain: Aphis fabae, Toxoptera aurantii, Aulacorthum solani, Colopha compressa, Eriosoma flavum, Eriosoma grossulariae, Eriosoma lanuginosum, Eriosoma patchiae, Eriosoma ulmi, Kaltenbachiella pallida, Tetraneura ulmi, Tinocallis platani, Tinocallis nevskyi and Tinocallis takachihoensis. Nafiseh et al. (2014) noted that Tinocallis nevskyi damaged elm trees through feeding and producing considerable amounts of honeydew, especially on trees in recreational areas.